Comrades good evening, to start can you introduce us your collective, the Antifascist Assembly of Piraeus? When was it created, in what context and with what goals? 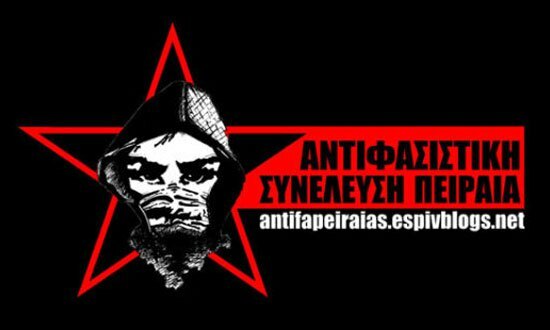 The Antifascist Assembly of Piraeus was created in November 2013, after the Pavlos Fyssas assassination. Our objective was to open up the issue of anti-fascism in Piraeus, a rather sensitive place at that time because of the existence of an organised nucleus of Golden Dawn which has been active for years there and because of the racism of middle-class Piraeans. Despite the fact that we were organising ourselves on the specific subject of the anti-fascist struggle, we are doing it around anti-authoritarian principles and practices. Our meetings are open (but not public) and are based on self-organisation. Beyond anti-fascism, our GA is also involved in struggles and activities concerning work, solidarity with migrants and self-organised expression and cultural creation. Because we consider that the issue of anti-fascism is not limited to physical opposition to fascist groups, but also includes the limitation of their ideologies and ideas about society (racism, homophobia, misogyny, militarism), our intervention in the Piraeus region is also based on a propaganda activity with posters, leaflets and street papers. At the same time, we have organised a series of cultural events (sports and music) in the neighbourhood, aimed at developing the local counterculture. P. Fyssas was assassinated by GD fascists in a district of Piraeus on September 18th 2013. Following this, the state sued GD, accusing it of being a criminal organisation, and many of its leaders were jailed, but now they have been freed and there is an ongoing legal trial. How does the anti-fascist movement see this process? First, we would like to say that, in our view, there is no single “anti-fascist” movement. On the one hand, there is the republican anti-fascism which simply defends democracy and the constitution; It gathers the whole of the left (governmental or not) for which the trial is a primary anti-fascist interest and concentrates its forces on it. On the other hand, from an anti-authoritarian point of view, our daily confrontation with the fascists and social fascism, and the ideas they propagate, is the main concern. Although the anti-authoritarian milieu is not homogeneous and there are divergent or even conflicting points of view, it is the only political and social space that has opposed the fascists in the streets and in the neighbourhoods, in the face of the much more severe and intense state repression than the one that struck the fascists. As an assembly, we are part of this environment, and therefore we have publicly expressed our opposition to the distraction represented by the GD trial and bourgeois democracy. A part of the anti-authoritarian milieu was involved in the trial at an immediate level as witnesses, such as for the GD attacks against anti-authoritarian local “Antipnia” in 2008 and against the “Synergio” in 2012, indicating however that anti-fascism is a subject of social confrontation and not judicial. GD has restructured recently, although it is not as strong as four years ago, how do you explain it? Although the trial seems to have “put pressure on” the fascists, in fact they have benefited from all the time they needed to restructure. After a certain time, first the leaders, then those who are lower in the hierarchy, were released. Then their local nuclei remained almost intact, with the notable exception of the local organisation of Piraeus, which was directly targeted over the assassination of Fyssas. Their parliamentary groups regularly participate in parliamentary meetings, and their representation at the local level (municipalities, regions) continues normally. Beyond the city of Piraeus, what about fascist presence in the streets? Fascist attacks in the streets are limited compared to the (pre-2013) period, but they did not stop. Recently there have been numerous attacks on migrants in Aspropyrgos, an industrial town in the west of Attica, where the fascists maintain their premises and an active local nucleus. During the year, there were fascist attacks on the refugee “host” State centres, as for example on the island of Chios. The fascists also “took an interest” in refugee children going to schools around detention centres, creating conflicts against their presence, such as in Ikonio de Perama (Piraeus) and Oreokastro ( Thessaloniki). We believe that the fascists will retain their forces until the end of the trial, in order to rebuild the assault sections and continue to attack migrants and militants. In August 2016, the migratory squat Notary 26 was the target of an incendiary attack, can you tell us a few words about the attacks on squats and militant premises in recent times? In recent times, fascist attacks against self-organised places have been limited. However, some time ago, a fascist group linked to GD had launched a series of incendiary attacks (more or less failed each time) against places of movement (but also from the left). It was in that context that the squat Notara 26 was attacked. In general, we see fascist attacks on squats as the other side of State repression. So where a prosecutor or judge warrant is not enough, there is a fascist incendiary bomb to do the job. Given that the people who supported or supported Syriza participated in anti-fascist initiatives and actions, how has the anti-fascist movement been influenced by Syriza’s rise to power in January 2015? The logic of delegation is part of the dominant ideology in Western societies. In Greece, the movement in a broad sense has failed to break this logic. Before 2012, everyone thought that fascism was only about 30 neo-nazis with shaved heads. Those who have only paid attention to electoral lists over the last five years have believed that the left’s rise to power would limit the fascist presence. More generally, Syriza’s electoral victories have considerably reduced the presence of people in the streets; Beyond disappointment and indifference, this is explained by the “hope” that things would be made better. Thus, capital and the State have found their best ally: the renewal of social democracy, which makes movements flow. By the beginning of 2016, thousands of migrants arrived in Piraeus from the Aegean islands, many remained in port for months, what was the State’s reaction? How has solidarity developed? Solidarity, though massive at first, did not escape the reflexes of bourgeois charity. Thousands of people cared about the empty stomachs of migrants. But hardly anyone seemed to see the issue in a more holistic way, no-one cared about refugee rights, their political regularisation and their grassroots social integration. While many people physically supported the migrants, in the end, political support remained a matter for the few politicised anti-authoritarians who could not even agree among themselves. The left-wing government succeeded in integrating ordinary citizens who looked kindly on migrants into its own projects. While ordinary people were in port to offer their services to refugees, the rulers had already decided to transfer refugees en masse to transit centers. At the same time, there was an enterprise promoting a logic of distinction between “political” and “migrant” refugees — a logic society was only too ready to accept. Many migrants have since been deported and others detained in detention centres. The involvement of NGOs was central. The NGOs that took care of refugees in Piraeus port are the same who later colluded with the Greek army and transferred the migrants to the “reception centers” [grassroots solidarity groups like Musaferat have described these as concentration camps] Also, many non-politicised people began to work for the interests of NGOs. We have seen that one of your leaflets concerns the history of Sana’a Taleb (a migrant woman who was detained at Elleniko camp). What actions do you take as part of the solidarity movement for migrants? What can you tell us about the situation in detention centres? In common with other groups, we have participated in mobilisations against detention centers such as Amygdaleza and Elliniko. In December 2015, together with other groups in the western districts of Athens and Piraeus, we co-organised a demonstration of solidarity with the migrants, ending at the port of Piraeus . The situation in detention centers has been the same for years: people are crammed in, without receiving basic care, and they are at the mercy of the detainees, waiting for their deportation. While, before the elections, the left had undertaken to close them, not only did Syriza not close any but it created new ones. "Syriza’s electoral victories have considerably reduced the presence of people in the streets; Beyond disappointment and indifference, this is explained by the “hope” that things would be made better. Thus, capital and the State have found their best ally: the renewal of social democracy, which makes movements flow." "The NGOs that took care of refugees in Piraeus port are the same who later colluded with the Greek army and transferred the migrants to the “reception centers” [grassroots solidarity groups like Musaferat have described these as concentration camps] Also, many non-politicised people began to work for the interests of NGOs."